Notable projects – The Wilson T. Ballard Co.
On September 7, 2011, the north abutment of Bridge No. P-403 (Baden Naylor Road over Rock Creek) was severely undermined due to scour, resulting in the loss of the abutment and collapse of the bridge and approach roadway during Tropical Storm Lee. Baden Naylor Road was closed immediately to traffic, resulting in more than a 6 mile detour. The existing structure was a single-lane two span continuous reinforced concrete slab bridge. The substructure consisted of two reinforced concrete abutments with wing walls and a solid-shaft reinforced concrete pier all on spread footings. 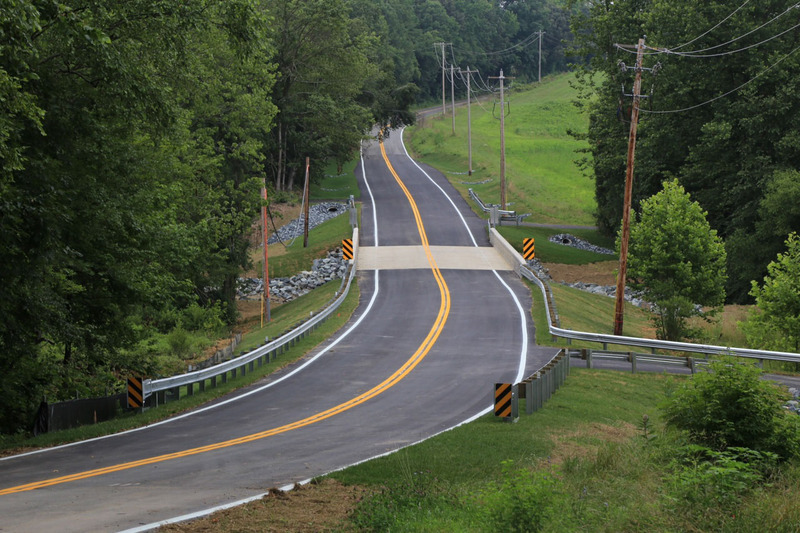 In late 2011, Prince George’s County DPW&T created a fast track project utilizing on call engineering consultant, The Wilson T. Ballard Company (WTB), and on call bridge contractor, Rustler Construction, Inc. 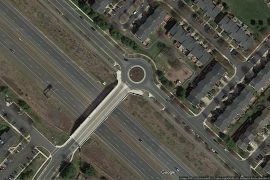 The design team included AB Consultants, Inc. to perform setting survey control; geotechnical investigation; and roadway, storm water management, storm drainage, and erosion and sediment control design. The project required a full range of engineering services including wetland identification; field surveys (topography, stream cross sections, property location, and boring stakeout); deed research; preparation of property mosaic, right-of-way plats and metes and bounds descriptions; coordination with utility companies; participation in wetland jurisdictional review; hydrologic and hydraulic analysis for out-of-kind structure replacement; environmental documentation; coordination with reviewing agencies; foundation and scour analysis; preliminary and final bridge design; preparation of contract plans, specifications and engineer’s cost estimate; participation in review meetings with County; review of shop drawings and consultation during construction. 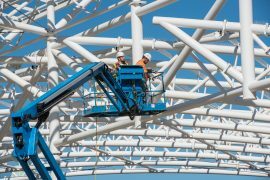 During the preliminary design phase, fabricators were contacted concerning availability of material, cost and delivery time of the superstructure beams, either precast prestressed concrete or structural steel. The delivery time for the prestressed concrete box beams was a third of the time as that for a steel superstructure and less costly, which were important factors in the overall project. The County selected the single span 72’ long prestressed concrete box beam bridge alternative on March 15, 2012, at which time the Design Team initiated preparation of Semi-Final Plans. At the Semi-Final stage, the County began negotiating the cost of the project with the Contractor. The Contractor was given Notice-to-Proceed on December 3, 2012, with a completion time of 180 calendar days. Construction was substantially complete and the bridge opened to open to traffic at the end of June 2013, 15 months from the formal design notice-to-proceed. 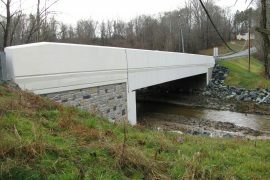 In approximately 18 months (including in-stream restriction) this team designed, permitted, acquired right-of-way, relocated aerial and underground utilities, removed the existing structure, and constructed a larger hydraulically appropriate bridge and approach roadway. The coordination between all parties, including the County, consultants, reviewing agencies, utility owners, contractor, and adjacent landowners, working together, accomplished the goal of putting the road back in service as quickly as possible. The Project Team collaborated on unique strategies and solutions in order to deliver an outstanding project on an accelerated schedule to address the concerns of the local community. 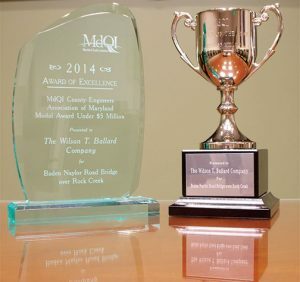 As a result, the Baden Naylor Road bridge project was awarded the County Engineers Association of Maryland (CEAM) and MdQI’s 2014 Project of the Year. During project planning, the Wilson T. Ballard Company served as co-General Engineering Consultant (GEC) taking a corridor-wide lead on right of way, utilities, H&H, air & noise analysis and the development of alignment options. We attended public outreach meetings, coordinated avoidance and mitigation options with the NEPA team, and developed cost estimates for the alternatives and assisted SHA and FHWA in the mega-project cost estimate review. As a major subconsultant to the GEC Joint Venture throughout the procurement and construction phases of the project, our team continued a corridor-wide lead in right of way, utilities, air and noise analysis. Our staff served as overall design compliance oversight management for Contracts B and D/E Modified, and provided design compliance oversight for roadway and drainage design under Contract B. We provided an Independent Environmental Monitor (IEM) to oversee mitigation projects within the Northwest Branch. Staff assisted in the management and design of several environmental stewardship and compensatory mitigation projects. 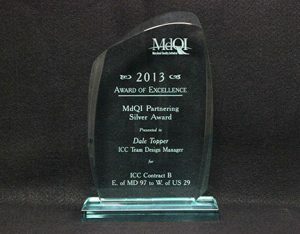 Our team was also instrumental in the development of design criteria related to stormwater treatment in the Montgomery County Special Protection Areas for the Paint Branch and Gum Springs tributaries, and design performance specifications for the ICC / MD 650 single point urban interchange (SPUI) and the ICC / US 1 continuous flow intersection (CFI). 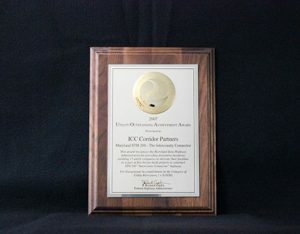 Throughout design and construction, ICC and the GEC won numerous awards including most recently the Engineering Society of Baltimore’s 2015 Project of the Year Award. The Takoma Park Langley Park area is located in in Prince George’s County, near the Montgomery County border, just north of the Washington, D.C. line, in a densely populated, culturally diverse community, with the highest volumes of non-Metro transit use in the D.C. Metropolitan area. The location known as “the Crossroads”— near the intersection of MD 193 (University Boulevard) and MD 650 (New Hampshire Avenue) is a well-known major hub of transit and pedestrian activity. By 2005, the growth in vehicular, pedestrian and bus traffic converging at the Crossroads resulted in a sharp increase in the rate of pedestrian crashes and pedestrian fatalities. Planners for the Purple Line recognized that a bus transit center at or near the Crossroads would address pedestrian safety and bus operations as well as the Purple Line station needs in the long term. In late 2005, the Maryland Transit Administration (MTA) retained The Wilson T. Ballard Company (WTB), to begin planning services for the Takoma Langley Crossroads Transit Center to be located at the site of the Taco Bell Restaurant in the southern portion of the Langley Park Shopping Center. WTB lead the project from initial planning to final commissioning. The project required a full range of engineering services, including geotechnical analysis, field surveys (topography, property location, and stakeout); right-of-way plats and metes and bounds descriptions; coordination with utility companies; foundation and structural steel design; preparation of contract plans, specifications and engineer’s cost estimate; participation in review meetings with Washington Metropolitan Area Transit Authority (WMATA) and other transit providers; review of shop drawings and consultation during construction. WTB provided all civil/site and structural design services and supervised a diverse team of architects, mechanical and electrical engineers, and landscape and irrigation consultants through planning, design and construction. Public involvement and environmental services, including all permit applications and hazardous waste assessment, were also provided. Although the site’s location is optimal in terms of proximity to more than a dozen major bus routes with four different transit providers (WMATA, Montgomery County – Ride On, Prince George’s County – The Bus and University of Maryland Shuttle), the site’s size is limited to just over one acre in size in order to minimize impact to the adjacent shopping center. Working closely with the Maryland State Highway Administration (SHA), the Langley Park Shopping Center and WMATA, WTB used real time computer simulations and full scale testing methods to develop a unique compact 12-bus bay design that accommodates the 60+ peak hour buses, with varying headways and layovers, and the hundreds of hourly passenger boardings and alightings. The bus platforms are covered by a 21,000 square foot parabolic glass-covered space-frame to allow natural light and ventilation while protecting passengers from the weather. In addition to the bus bays and passenger platforms, the site includes a 1,152 SF Transit Facilities Building with lobby, restrooms, offices and ticket vending. The project incorporates state-of-the-art sustainable building and site design features, including solar panels in the glass roof that will fully support building electrical use; rain water harvesting, and a grey water irrigation system to support the plantings in the bioretention areas. The bus platforms will be equipped with real time passenger information displays with LED Next Bus arrival signs and other important route and schedule information. The project is scheduled to open Fall 2016.